07 Feb 2018 / 09:54 H.
NABLUS: Israeli forces on Tuesday shot dead a Hamas militant suspected of murdering a rabbi as two killings of Israeli settlers in a month sparked deadly clashes in the occupied West Bank. Another Palestinian was killed and several dozens wounded later in clashes with Israeli forces during a raid in the West Bank city of Nablus, the Palestinian health ministry said. The army apparently entered Nablus to search for a Palestinian who had stabbed and killed the second Israeli settler, also a rabbi, near the major West Bank settlement of Ariel on Monday. Hundreds of mourners attended the funeral on Tuesday for Itamar Ben-Gal, the 29-year-old man killed a day earlier who was also a rabbi. A medical source said the Palestinian in Nablus, shot in the chest, was Khaled Tayeh, in his 20s, whose name did not match that of the suspect named by Israeli authorities. There was no indication of a direct link between Ben Gal's killing and the fatal January 9 shooting of rabbi Raziel Shevach. Shevach's suspected killer, claimed by militant group Hamas as one of its members, was shot dead in a pre-dawn raid hours after Ben Gal's killing. Violence is common between Palestinians and Israeli settlers or security forces in the West Bank. The Israeli army said it had detained seven people during the Nablus clashes but had not found the "terrorist" suspected of Ben Gal's killing. "The security forces will catch whoever tries to attack Israeli citizens and we will deal with them to the fullest extent of the law," Israeli Prime Minister Benjamin Netanyahu said Tuesday. Both attacks have led to Israeli calls for more settlement building in the West Bank, which has been under Israeli occupation for more than 50 years. Earlier this week in response to Shevach's murder, Israel's government in a rare move decided to "legalise" the rogue West Bank outpost where he lived, Havat Gilad, essentially creating a new settlement. 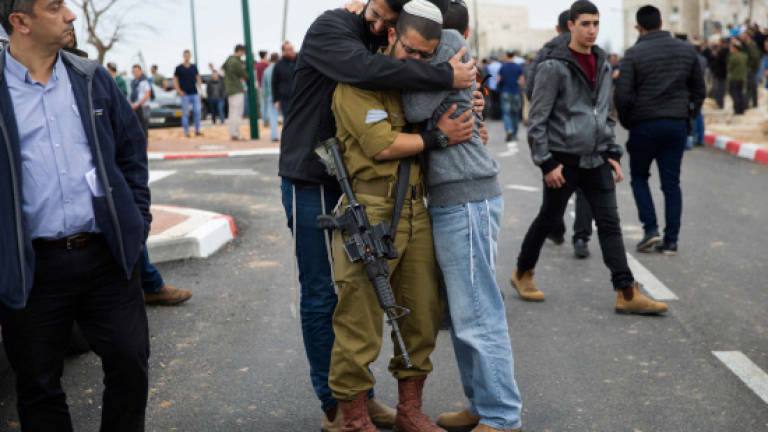 There were further calls for more settlement construction at Tuesday's funeral for Ben Gal held at the Har Bracha settlement where he lived, Israeli media reported. Shevach's suspected killer, 22-year-old Ahmad Jarrar, was killed in the village of Yamoun near Jenin after a weeks-long manhunt. Dozens of Israeli army jeeps entered the village overnight, prompting clashes with live fire, according to a Palestinians security source. He was the son of a Hamas figure killed by Israeli forces during the second intifada of the early 2000s. Israel's Shin Bet domestic security agency said that during the attempted arrest, the "terrorist" came out of a building and security forces fired in his direction. "An M-16 assault rifle and a bag containing explosives were found near his body," it said. Hamas's armed wing, the Ezzedine al-Qassam Brigades, said it was a "Qassam bullet" that killed Shevach, 35, though it was unclear if the Hamas leadership was claiming direct responsibility for the attack or whether the cell acted alone. Israeli forces had set up roadblocks and checkpoints to hunt for the rabbi's attacker. Two Palestinians were killed during earlier raids Israeli security services said were launched to find Shevach's killers. Monday's stabbing happened near the major Israeli settlement of Ariel. A video published online showed Ben-Gal waiting for a bus as the assailant crosses the road and stabs him in the chest. The assailant was identified in Israeli media as the son of an Arab Israeli woman and a Palestinian father from the West Bank city of Nablus. Speaking with her identity obscured, his mother told Israel's Channel 10 that she disagreed with his actions and hoped he would turn himself in, but also said she had not seen him for three years. US ambassador to Israel David Friedman, who has been a supporter of settlement building in the past, said on Twitter he was praying for Ben Gal's family. "Twenty years ago I gave an ambulance to Har Bracha hoping it would be used to deliver healthy babies," he wrote. "Instead, a man from Har Bracha was just murdered by a terrorist, leaving behind a wife and four children. Palestinian 'leaders' have praised the killer." Israel faced sharp criticism from the administration of former US president Barack Obama over settlement construction, but that has not been the case under his successor Donald Trump. Trump's declaration of Jerusalem as Israel's capital on December 6 was also hailed by Israelis, while deeply angering the Palestinians who see the city as their capital as well.